On Thursday it was my husbands day off from work, so I talked him into going shopping!! IKEA was the perfect date, with a large cooked breakfast to swing him into going and a chance for me to grab some things I had been planning to buy for a while. Now planning another trip for things I forgot!! Share you style Saturdays blog hop are now finished. 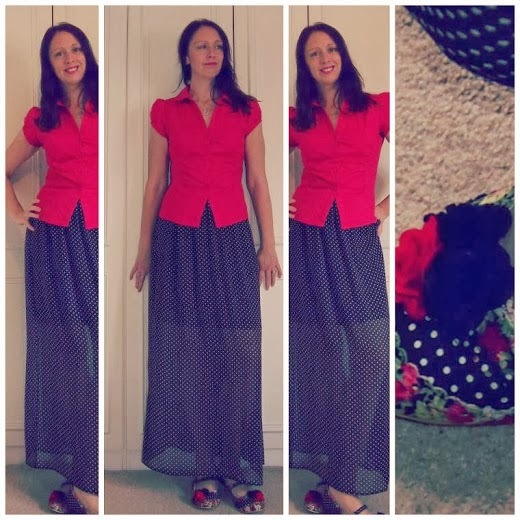 You can share all your outfit posts at Creative Mondays blog party. Exquisite photos! Really very nice red shirt! I love the shirt and the skirt!! Pretty outfit x I love Polka Dots no matter how big or small! It certainly would be hard to pass that shirt Claire! It is very beautiful. You got great items while shopping!